Today's guest post is from the creative Roopa of Putti Prapancha. Roopa and her daughter Putti have so much fun together and her blog is a wonderful reflection of that. They recently did some Ice Cube Fabric Painting that turned out so beautifully. Some of my favorite projects are their Stamping Art - they use so many creative tools from celery and pasta to styrofoam plates. 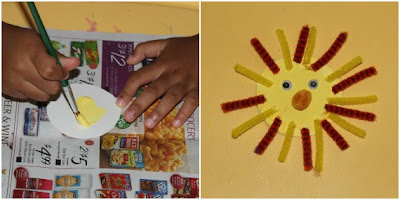 Today I shall share with you all, these simple paper tube lion and mouse puppets we made after reading the book "The Lion and the Mouse" which is one of Aesop's Fables. Puppets are our favorite way to retell a story. They are so simple and easy to make and yet so much fun. We used things found in our house, just like we did with the Five Little Ducklings Puppets. First, paint an empty toilet paper tube yellow for the lion and grey for the mouse. Then, cut out a small circle for the lion's face and paint it yellow(you may use yellow construction paper instead). Once it dries, stick on 2 googly eyes, a tiny pom pom and yellow and orange pipe cleaners (chenille stems) for the mane. You can glue thin stripes of yellow and orange construction paper in place of pipe cleaners, whatever your kid fancies. For the mouse, cut a small oval and 2 little ears. Paint them grey with a little black for the center of the ears. Then glue on googly eyes, a black pom pom nose and black chenille stem (or thin stripes of back paper) whiskers. Don't you love these Lion and Mouse Puppets? 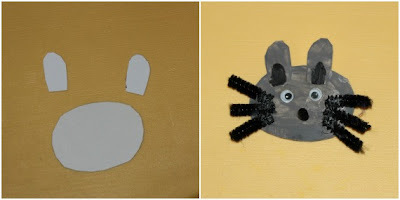 You may want to check out the handprint lion and mouse we made to go with the same book. Thank you for sharing these with us Roopa. I am a TP roll fan - so many possibilities! I love how you used them to retell a story. So cute Roopa!! I'm definitely saving this idea to help use up our basket full of empty tp rolls!! These are adorable, Roopa! My daughter loves the story of the lion and mouse, so she would have fun with this! And we have been saving old tp rolls so we have everything we need for this.